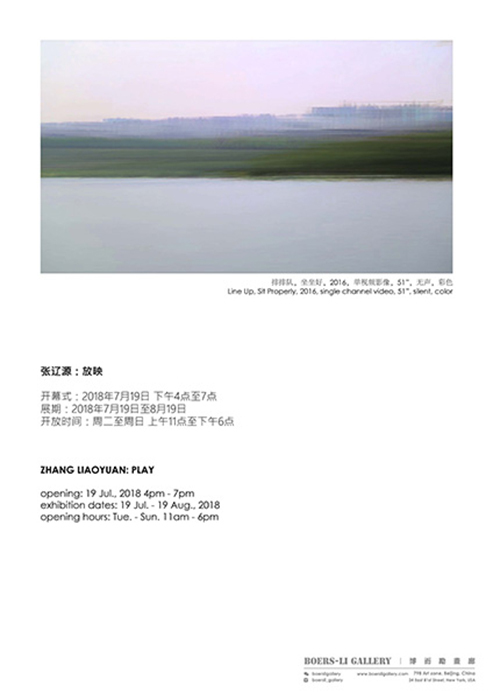 Boers-Li Gallery is delighted to present “Zhang Liaoyuan: Play”, the artist’s first solo exhibition with the gallery, opening on July 19, 2018. Among the 7 works on view, a number of recent projects are paired with works selected from the past decade to offer an overview of Zhang Liaoyuan’s conceptual endeavors. As one of the first graduates of the New Media Department at the China Art Academy, Zhang Liaoyuan’s artistic practice comprises of manipulating video, photography and installation that address the phenomenon of vision, and the processes of image formation. His recent works presented in this exhibition, Zhang Liaoyuan takes on a playful attitude in addressing the complex conceptual notions that often dictate the act of viewing, and subsequently impact our perception. In some cases, his investigations are carried out through manipulating the elements in the context of viewing in order to create the illusory perception of reality. Billions of Pixels (2018)provides the illusion of film watching as the viewer comes into a dark room, looking at the other spectators in the gallery space paired with amplified ambient sound, while Images on the Wall (2018) is a projection of live footage taken on the street outside of the gallery, onto a wall whose surface is shaven off by 5 mm so it seems that one is watching the live footage with the expected noise. In other cases, such as Play (2018) and Lazy Afternoon (2018), Zhang translates and superimposes the film footage as abstract forms on the wall that create illusions of an otherwise warped reality. Zhang Liaoyuan’s interests in exploring the conceptual notions of viewing can be traced back to his earlier works. Anonymous Island (2008) transforms an adhesive tape into film rolls with printed images; Line Up (2016) and Between 0-255 (2010) are manipulations of the primary element of digital image, the pixel, where the former re-aligns the pixels of an image according to its RBG values to form an abstract image, while the latter plays a given pixel from a Fellini film in a lamp shade, thus converting its property to constitute an image to the light source that makes the image visible. Zhang Liaoyuan (b. 1980), graduated from the New Media Department of the China Academy of Art in 2006, is currently a lecturer at the department, who lives and works in Hangzhou, China. His recent solo exhibitions include, “Frame”, Arrow Factory, Beijing (2018); “Half Fermentation”, Imago Kinetics Lab, Hangzhou (2017); “Update”, Cultural Pavilion (an online platform for media art) (2016) and etc. His works have been the subjects of group exhibitions including, “Presence”, China Academy of Art, Hangzhou (2018); “Simultaneous Eidos – 2017 Guangzhou Image Triennale”, Guangdong Museum of Art, Guangzhou (2017); “Summer Recorder”, Hunsand Space, Beijing (2017); “Bunker- Dialogue”, The Bunker, Beijing (2017); “Dig a Hole in China”, OCAT Shenzhen, Shenzhen(2016); “On/Off – China’s Young Artists in Concept and Practice”, UCCA, Beijing (2013) and etc.